I'm going to visit Saudi Arabia in a couple of weeks time, as I've been offered a job there. I can't talk about the details here, but suffice it to say that I've promised everyone I will make my decision after I've been for the look-see. I'm naturally a very decisive person, so I am finding the self-imposed limbo quite challenging! Today I'm in Hanoi. I was scheduled to come up for a work trip today anyway, and lucky that was so, since I also have to visit the Saudi Embassy to get my passport stamped. In Hanoi, like in Saigon, most of the embassies are on on the same street, so in the taxi I drove slowly along until the next gate said Saudi Arabia on it. Yesterday, I called to ask what time the embassy opened, whether I needed to make an appointment, and what the fees were. The guy on the phone spoke almost no English. I asked "do you speak English?" And he said: "Visa, 10 o'clock. Visa! 10 o'clock!" at increasing volumes until I said "OK!" and hung up. I sent an email to the address on the website and got an error message: this email address does not exist. I'm glad that I was already coming to Hanoi anyway, and wasn't making a special trip, as I may have had to - I wasn't filled with confidence. At the gate of the embassy were two security guards. I arrived deliberately early at around 9:30, fearing a queue and knowing I have other meetings today. The guard said: "10 o'clock!" and "Arup Sudi?". I think they were worried I was in the wrong place, I'm not wearing my abaya today. When I asked if there's a cafe nearby they actually smiled and pointed me in the right direction. Let me tell you- it's not easy to get a Hanoi security guard to smile. When it was confirmed that I would be going to Saudi, I put up a message on the Saigon expat listserv we like to call Unfair Neighbours. I have to go to Saudi Arabia, does anybody know where I can get an abaya in Saigon? And lucky for me, a kind lady wrote back and said she had one she's been trying to get rid of, and I was welcome to it. I picked it up in the morning before work on Monday, and my workmates helped dress me in it, and then took photos. 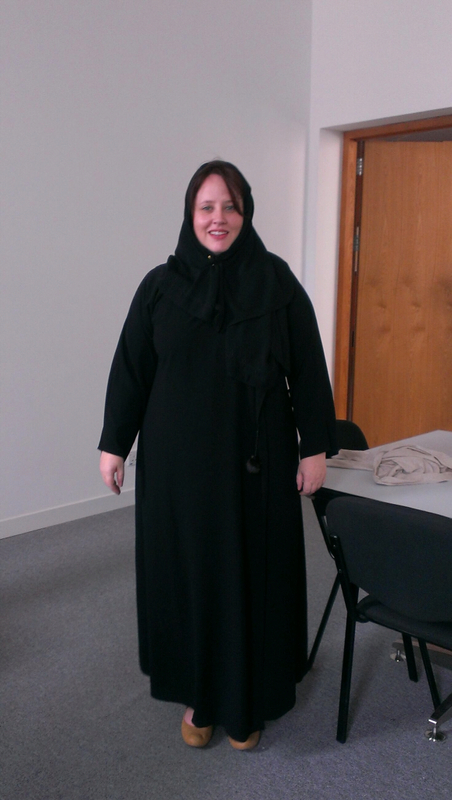 It made of very light fabric, but it's still hot under an abaya. Luckily I won't have to wear it all the time on this trip, just at the airport, and on the journey from the airport to the campus of the university. On campus it's not required. I can say one thing about this decision - if I had to wear an abaya all day every day, I wouldn't be going. It's now nearly 10 o'clock. 10 o'clock! Visa! UPDATE: "The man who will sign this not come today."